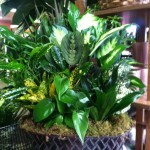 We are Flower Express however we carry a variety of plants as well. Though not in bloom a green plant can give a room so much life. They are appropriate for many occasions including sympathy, get well, housewarming, or just to let some one know you’re thinking of them. We have a wide choice beyond single potted plants. Come check us out. 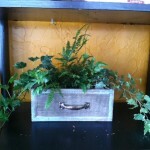 Dish garden in decorative oval metal container. Also available in baskets and ceramic containers. Ivy and varigated ivy drape out of this shabby chic drawer. 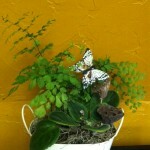 Cute mix of African violet and maidenhair fern in a French inspired tin accented by pods and butterfly. Succulents and air gardens are a contemporary & unique option. 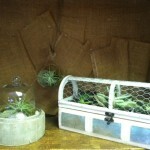 Available in a variety of containers from glass ornaments to terrariums.